A critical earnings release and some major content investments are on tap for the coming month. 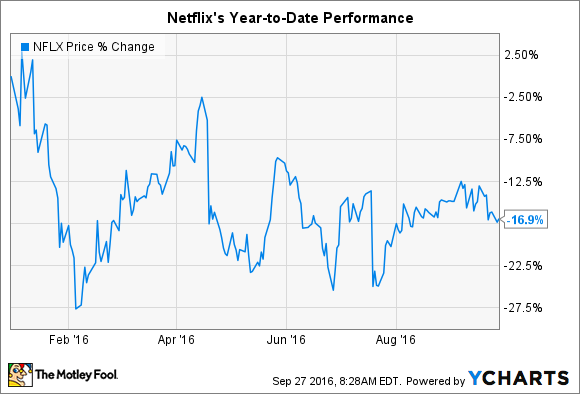 If you're a long-term Netflix (NASDAQ:NFLX) shareholder, you know something about volatility. Just this year, shares have ranged from between a 3% gain and an almost 30% loss. Heading into the final quarter of 2016, Netflix is trailing the broader market by over 20 percentage points after finishing last year as the top performer in the S&P 500. The stock is especially controversial following a second-quarter report in which the company admitted that subscriber growth wasn't meeting executives' expectations. On the one hand, profits are up, and CEO Reed Hastings says the prize ahead for disrupting the TV market is "as big as ever." On the other hand, many existing customers are balking at its latest price increase, raising doubts about its plan to improve content quality while still generating serious profits beginning in 2017. Netflix's third-quarter earnings report is set to publish after the market closes on Oct. 17. With management forecasting a subscriber-growth slowdown, investors have some key questions going into this release. First, is rising competition a problem or not? Last quarter's membership numbers underperformed expectations as more members decided to leave the service rather than pay $1 or $2 more per month. CEO Reed Hastings and his team believe this is just a temporary bump that will end when the price hikes finish rolling out in the fourth quarter. As evidence for this reading, they point to healthy new customer sign-up figures that include the higher prices. "In terms of new members which is most of what drives growth, the new pricing is working great," Hastings said in a conference call with investors. It's possible that subscribers are being drawn away to rival services like Amazon's Prime video, so gross membership addition numbers will be critical to watch this month. Second, Netflix's spiking content spending, especially on original shows and movies, has kept free cash flow at an over $250 million loss in each of the last four quarters. Hastings has forecast significant overall profits beginning next year as international markets mature, but cash flow issues might linger well into 2017. These figures will play a primary role in deciding how much new debt Netflix decides to borrow either in the fourth quarter or early next year. The company took out $1.5 billion of loans during its last dip into the credit market in February. Executives will hold a live-streamed earnings interview following the quarterly release, and investors can watch the chat at the company's official YouTube page. Netflix is making steady but slow progress towards its goal of rivaling Time Warner's (NYSE:TWX.DL) HBO in terms of overall content quality. The streaming service attracted 54 Emmy nominations this year, compared to HBO's industry-leading 94. It's less well known that Netflix is already leading in the category of kids shows: It garnered 33 daytime Emmy nods for its original content produced for children, the most of any network. Skylanders Academy launches on Netflix on Oct. 28. Image source: Activision Blizzard. Investors should look for the company to try extending that lead with Skylanders Academy, scheduled to launch late in the month. The series is aimed at kids of all ages, and is the first project produced by video game developer Activision Blizzard's (NASDAQ:ATVI) in-house media studio. Netflix seems confident that the show will pay off, as another season is already slated for launch next year. The push follows September's official launch of Netflix's multi-year deal for Disney content. There's no telling whether October will be a positive or negative month for this volatile stock, but in either case investors will get to see how the business is progressing compared to management's major targets while disrupting the linear TV model.